Pair of Plantopia Easy Fill Basket Watering Fountains. Amazing new hanging basket watering system, gets water to the centre of the basket where it is needed. British designed and manufactured by the team behind Plantopia Easy Fill baskets. Designed to fit 12in and 15in Easy Fill baskets, but fits any type of wire, rattan or other baskets. Easy to insert at planting, they discretely peep over the edge of a planted basket, so easy to fill with water. Supplied as a pair of waterers, no assembly required. The amazing and hot off the presses New Basket Watering Fountain kit solves a problem many of us experience in last summer's heat wave - getting and keeping enough water where it is needed in your hanging baskets. It's the latest innovation by the clever folks at Plantopia - they who invented the best-selling Easy Fill Hanging Baskets - this clever device takes water to the heart of the basket, slowly releasing it where it is needed in the root zone, through small holes that drop water out. Designed to specially clip fit onto the bottom of 12in and 15in Easy Fill baskets, they will also do the same job on traditional wire mesh, rattan or other baskets, and even larger pots and containers too. The flared funnel end sits neatly and unobtrusively on the edge of the basket, making it easy to fill with a hose or watering can, quickly getting feed and water to the inside of the basket - hard to reach when watering from above. Saves you time and water too! A great value, Great British invention that every proud hanging basket grower should have. Sure to win Gardening Awards this season. 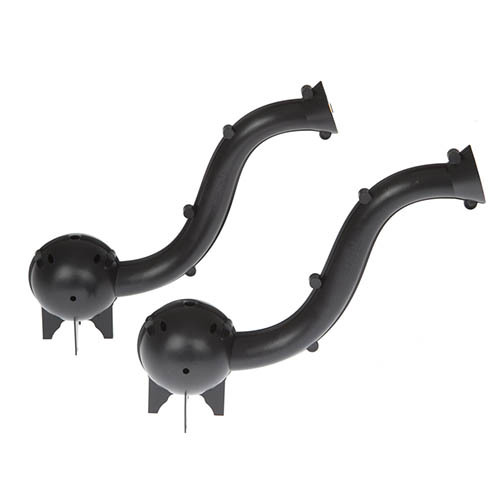 Supplied as a pair of black injection moulded recycled plastic Water Fountains, c. 30cm long, re-usable many times.